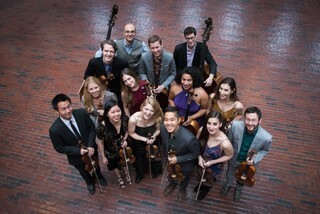 Palaver Strings hosts a free performance workshop in preparation for their February concert series, Seeking Sanctuary. This event will explore the impact and presence that Chinese music and art has on the city of Boston. After a music performance and personal narratives, participants will be invited to share reflections through an interactive art installation. This art collage will be displayed at Palaver Strings’ concerts at the Boston Center for the Arts. Participants will receive free admission to Seeking Sanctuary at the Boston Center for the Arts on Sunday, February 11. At a time when immigration policy is at the forefront of our national politics, Palaver seeks to humanize the conversation by providing an artistic outlet for these stories, and emphasizing their connection to our own immigrant heritage. The Seeking Sanctuary concerts showcase the journeys and experiences of Boston immigrants. With a special focus on the Irish, Cape Verdean, and Chinese communities, this program will feature new compositions, spoken word pieces, and a participatory art installation inspired by the incredible stories of immigrants and their descendants.